Over the last couple of days we have enjoyed some interesting flying out here at Kahana, in tradewinds that were blowing more northerly than usual. When the trades turn anywhere north of their usual easterly heading, we typically expect to have a better chance to make the easterly crossing of the mile-wide bay and get up on the far side. According to the forecast I had dreams of epic missions to Kualoa, or beyond. It seems like ages since we've been over that way! On Tuesday we enjoyed a gorgeous sunny afternoon in breezy NE trades. Flying with Jim, Jeff and visitor Steve from Washington, we tried to cross a bunch of times (I personally made three attempts) but it just seemed to be a bit too strong. The direction was more straight in to the bay than usual, so the headwind factor was definitely reduced, but the windstrength required us to crab so hard to the left that we expended too much glide to make it all the way across. This just wasn't the day to make the bay-crossing dream come true. Heading in to land and go pick up Amelia, I was compelled to pause over the trees on the beach to make a few passes in the nice straight-in airflow. I didn't realize Jim was following me in, and for a moment there we were playing chicken over the beach and surf, before I bailed out of the lift to allow him to make a typical approach. Glad we worked that one out! Yesterday, wind conditions improved to moderate NNE tradewinds, and I was hopeful that the decreased windstrength and the increased northerly component would bring the bay crossing into easy reach. I launched first from the north ridge and found the airflow to be very cross from the rhino horn side - I barely managed to squeak around and get up. Don tried to follow, and struggled valiantly just above launch height for a long time, but couldn't quite get around into the lift on the Punaluu side, so he skillfully toplanded after a while to take a break. Meanwhile, I managed to get just above 1600 in pretty light lift, and blazed across the bay encountering no headwind at all. But I still fell just slightly short of the knob over there, sinking behind the knob just as I got close. Dang! I turned back thinking I'd be lucky to make the LZ with less than 500 feet of altitude to work with. But as I retreated, I was surprised to find I wasn't losing much height, and I continued back across the bay towards the launch ridge while keeping an eye on my height and on the LZ. My vario actually started beeping at around mid-bay position, and I began to think I'd actually make it back, and save myself the trouble of folding, packing and hiking back up. As I got close, I realized I was coming in a lot lower than I'd hoped, but I still managed to drop into a small clearing just above the treeline on the north side. Sheez, maybe a bit too close for comfort. Don helped me detangle from some small rubber trees and hike my stuff back up, while Scrappy radioed to say he was just arriving. 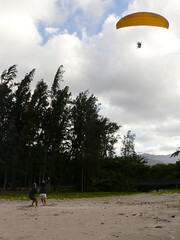 Thanks to Scrappy for calling the fire bureau to counter any potential reports of a hang glider crash at Kahana. I got back up top, and quickly relaunched in conditions that were decidedly even more north than earlier. A swirly gust from the rhino horn picked me up off my feet, and I spun to face forwards as I was lofted and deposited on my back at the ridgetop. Laying there, I kept flying the wing, until another swirly gust picked me up and shot me off to the east, away from the rhino horn, but also slightly upwards. Then I noticed an instantaneous and disconcerting feeling of rapid descent, and saw my leading edge rippling. Hands up! Then it happened again. Um, Maybe the airflow was really just a bit too northerly after all. This dream-chasing adventure was turning into a nightmare! I flew out to the east, away from the ridge area, hoping to find some lighter level of turbulence that I could handle, and maybe work it wide around the corner in some net lifting air, but I ended up getting way too low and had to beeline back to the LZ. Fortunately I hit no sink on the way, and pulled in with enough height to clear the trees and soar them for a few passes. I even got to soar the Kaaawa side of the trees and got nice lift there for the first time ever. Just was I was landing, Czech Peter and visitor Steve showed up. Peter made the hike to join Don and Scrappy at launch, while Steve wisely opted to wait with me at the beach. After over an hour waiting for better conditions, Don hiked down, leaving Scrappy and Peter to continue their vigil at launch. Peter finally decided to attempt a launch, but after inflating his wing briefly up there, the swirly turbulence convinced him to abort before he was forced to repeat my little adventure. Peter and Scrappy soon joined us down at the beach, just as Wayne showed up to join the fun. The airflow at the beach felt brisk and perfectly perpendicular, and the guys decided to do some kiting to salvage the afternoon. I suggested we try to re-enact the timeworn legend of hand towing pilots up into the lift over the trees. Scrappy found a nice long rope, and Wayne contributed a cool kite-surfing bridle release, and soon Peter, Scrappy and myself all got a shot at being towed up over the trees. Scrappy enjoyed the lightest wing-loading and got the most airtime, almost getting fully established up there for a legendary tree-soaring flight, but not quite. It's harder than in the old days because the trees have been thinned out, and some of them lean way out, but I think if the wind had been slightly stronger, it would have been a sure thing. Or maybe I'm just dreaming.